The Hamilton 4 piece set is a sleek look for this black and white woven collection: a classic look of luxury with simple, clean lines, and rope and zipper detailing. Add a splash of color for fun with a red pillow or throw. 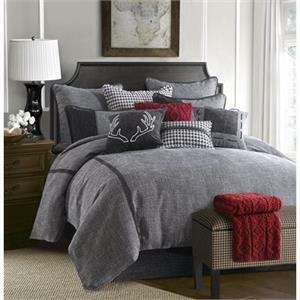 Comforter has soft chenille accents, and shams have chenille piping. 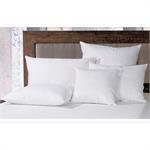 Can be enhanced with many open stock pillows and euro shams. 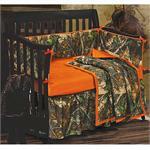 Four piece king set includes comforter, bedskirt and (2) king pillow shams. 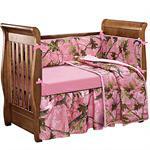 Measurements: oversized super king comforter 110" X 96", king bedskirt 78" X 80" + 18", king pillow sham 21" X 34". Dry clean only. Comforter: face: 100% cotton, back: 100% polyester, filling: 100% polyester, bedskirt: 100% cotton, decking: 100% polyester, pillow sham: 100% polyester. Imported. 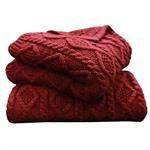 Chase the chill away with this soft and striking cable knitted throw with diamond accents. 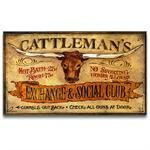 It makes a lovely addition to any bedroom or living room. 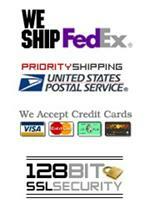 Available in cream, green, and red. 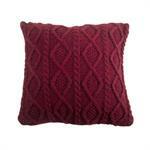 Red cable knit pillow with diamond features makes a great accent piece in several of the Landmark collections. 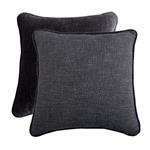 Adds softness and texture to your bed or sofa. Measures 18" X 18". Hidden zipper closure. 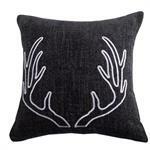 Surprisingly soft charcoal gray chenille pillow embroidered with white antlers, this item is a nice accent to the Hamilton collection. Measures 18" X 18". Hidden zipper closure. Spot clean recommended. Shell and filling: 100% polyester. Imported. Soft yet sturdy, this Hamilton reversible euro sham features a charcoal gray chenille side and a two-toned cream/gray woven side. 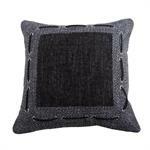 Finished with chenille charcoal gray piping, this pillow measures 27" X 27". Insert not included. Hidden zipper closure. 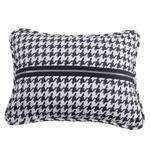 Center zipper detail is the main focus of this hounds tooth decorative pillow. Features self-piping and measures 17" X 13". Spot clean recommended. 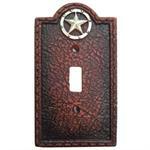 Shell: 65% cotton/35% polyester, filling: 100% polyester. Imported. 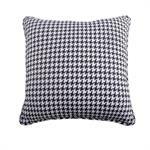 Rugged and timeless, this cream and charcoal hounds tooth euro sham is a great accent piece in the Hamilton collection. Features self-piping and measures 27" X 27". Insert not included. Hidden zipper closure. Dry clean recommended. 100% polyester.